← Remember the Golden Rule! Whoever has the gold, makes the rules! 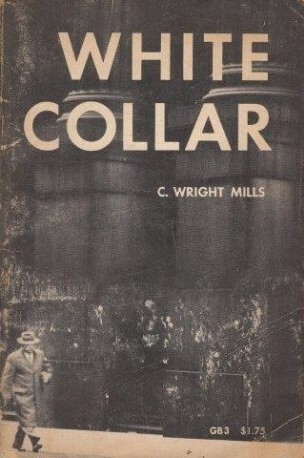 White Collar: The American Middle Classes is a pioneering and major study of the American middle class by a prominent sociologist C. Wright Mills, first published in 1951. In this research Mills analyzes the forming of a new class of the white-collar workers and also deals with the social alienation in the world of advanced capitalism, where cities are dominated by bureaucratic units of management and “salesmanship mentality”. Scrutinizing the politics of the American middle class, Mills coins an acute term of “the politics of the rearguard” and provides insightful observations which, in my view, could be easily applied to nowadays. This entry was posted in Books and tagged bureaucracy, C. Wright Mills, capitalism, Middle class, politics, United States. Bookmark the permalink. Undoubtedly Wright Mills’s typology of the white collar – middle class living in a prosperous post WWII american capitalist society is a classic approach to understand the american middle class, which was a conformist social group, part of a system, expressing its political conformism, at the same time, serving a useful bureaucratic role to the american networks of the multinational corporations and holdings. Mills’s conceptualisation of the american middle class political opportunism, obviously correspond to an specific momentum in the social, cultural and economic evolution of american capitalism. Mills’s sociological analysis of the white collar is in addition a contribution to the analysis of the social classes in modern industrial societies with high levels of wealth concentration by financiers and monopoly groups controlling social and economic activities in a society ruled by principles of consumption and fetichism of the market-production. However, Mills ‘s study of the USA middle class, is a positive reference to compare with other historical situation of social changes in modern societies. Latin American is an example in which the middle classes or white collars (Mills concept), played a political role to incentive the social changes and political reforms to the traditional agrarian – oligarchy system of government. a strategic alliance between the liberal middle class with a socialist- working class. To understand this unique social combination of alliances in the class system of Chile, it is necessary to know the historical process how the ruling class, the landholders, traditionally conservatives and catholic, confronted in the 19th century, groups of liberal intellectuals of middle class origins, and the transformation of the agro-economy into a mixture of semi-industrial and export – mining, creating at the end of the 19th century an emergent proletariat who started earlier in the 20th century to influence the Chilean politics and society. agreed to impulse a reformist movement to modernise the Chilean society. This process in which the chilean society is changing from an oligarchy to a transitional middle class-intellectual occurred after 1925, and continued until 1938, when, this process of social transformation, impulsed now by an organised trade-union movement, and with the existence of various new political parties, radicals in their conceptions to end with the oligarchy control of the chilean society, and to introduce reforms in the education, health, labour relations, protection to the country natural resources, and transformation of the political system in favour of a social-democracy. The chilean social process of modernisation or reformism continue by a successive Presidential democratic elections, in which the middle classes, professional and intellectuals were principal agents for social changes, in alliance with an organised working class movement. The radicalisation of the middle classes a phenomena inclusive in the army officers, navy middle-ranks and air force in the 1930’s & 1940’s. I.e. A retire General Carlos Ibanez del Campo, presenting a middle class nationalism, in 1938, renounced to his Presidential candidature and supported lawyer and academic, Pedro Aguirre Cerda, who was elected President representing the “Popular Front”, an exceptional coalition of political parties representing the middle-class and the chilean industrial-mining proletariat. Chilean Military School. However his secondary education, six years, he studied in Linares in his local secondary state school before to go to the military state academy. Middle – classes intellectual, academics, professionals and politicians were reformists who introduced or propagated important social, economic and political reforms in the traditional and oligarchy political system. eliminate any vestiges of democratic reformism of the previous elected governments, even abolishing the democratic “Constitution of 1925” and all democratic legislations in favour of better social aspiration of the middle classes. What is more of this new rulers, they abolishing the public free school system: primary, secondary and tertiary and installed without opposition a private and expensive education system, in accordance with their concepts of a free market-education. Economic fundamentalism was in the mind of the new rulers. It was the end of the social aspirations of the middle and popular classes, the system of social relations was under total control of new rulers, landholders transformed in prosperous businessman under the protection of the mysticism of free market and free competition. The progressive and reformist soul of the middle and labour classes were definitively killed and replaced by a system of opportunism and corruption of the state institutions, i.e. members of the Congress financed by local investors, and speculators, who profit with their enterprises, politicians, who as middle class are accomplice of their own social tragedy to destroy or deterrent to any social and democratic aspirations of the present chilean middle and popular classes. Thank you Professor Monroy for these enlightening comments!